The video below is how to add a Portfolio Item to a Portfolio Gallery when using the Canvas Theme. Portfolio Items are a great way to show off a piece of artwork, but also for that piece to have it’s own page where you can put information about the item, a contact form, or even a payment button. The video starts off with a quick tutorial in Photoshop on how to keep your image in proportion, yet make the image square to keep all your images uniform on your website. Keep in mind that you don’t necessarily have to keep the images square in all cases, but if you keep them relatively close in proportion and size, they will generally line up better in most themes. This webinar will be presented by Russ Larsen and cover a lot of information about using images on your website including resizing, adding borders, making your pictures Search Engine Optimized, displaying thumbnails correctly, adding galleries, finding images you have previously uploaded, adding a slideshow and more. If you want to learn how to use photos on your website, you do not want to miss this webinar. 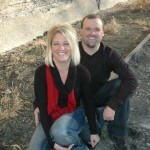 We will also include basic tips and techniques on taking pictures and displaying them on your website. We will also be going over many ways to display photos on your website and how you can save a lot of time once you know the basics of how to work with your photos in wordpress. We will be dealing mainly with Nextgen Gallery Plugin inside wordpress. The webinar will be presented through Profitable Hobbies and The I&E Network, but everyone is invited to attend. Webinar will be Wednesday, August 25, at 7:00 p.m. Mountain Time. 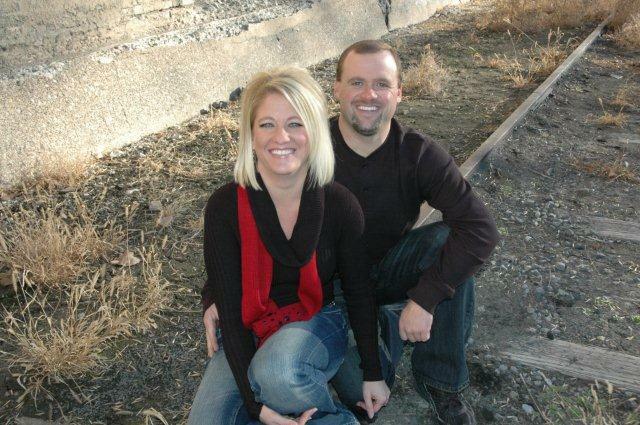 I have changed part 5 of my Web Site Webinar Series to tonight – Tuesday, May 18, 2010 at 7:00 p.m. MDT. In part 5, we will go into more detail about working inside the wordpress dashboard. If you are working on your wordpress web site – or just getting started – tonight’s webinar will help you with the above topics. All of these are items that you must understand and learn. The recording will be available to all Taking Aim Marketing Clients – but if you want to attend LIVE – you can register below. When I first started creating training videos to teach my clients how to add content to their own web sites, one of the first problems I ran into was trying to figure out how to keep the various training videos organized and accessible. My web site clients often want to return to a video to watch or review several times. As most of you know, as you continue to post more and more blog posts, the older posts get buried and eventually archived. I wanted even the oldest training videos to stay easily accessible, so I have created a new web page on Taking Aim Marketing, called Video Training Directory. It can be found right along the menu bar with the other web pages. 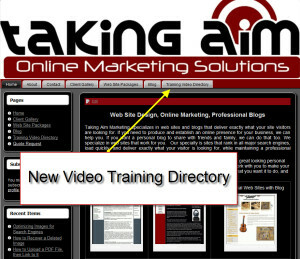 This directory contains links to the most popular video training tutorials for Taking Aim Marketing clients to view at their convenience. There is also a form on the page where you can submit a video request. If you cannot find an answer to a question, please use the form to submit a video request. We will make a training video and notify you when it is ready. Don’t forget to Subscribe by E-Mail to be notified each time a new item is added. I will be presenting part 2 of my webinar series for Profitable Hobbies and The I&E Network, this Wednesday night at 7:00 MDT. Last week was very basic and I went over the process of getting a web site started and some of the advantages of wordpress as the platform for a web site or blog. From this week forward, we will be working inside wordpress. 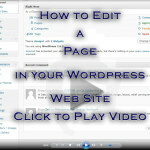 I will be showing how to add pages, add posts, create photo galleries and more. If you want to become more comfortable inside the wordpress dashboard, it would certainly benefit you to attend. Register for the webinar by clicking the Register Button below. If you have a particular question or problem that you would like addressed, please send it to me in advance. Hope to see you all there on Wednesday Night. Just in case you missed my last post – I did a video showing how to edit the home page of your site, if your wordpress site is set to display a static home page. You can download and view the video at this page – here. I will be presenting a blogging webinar to Profitable Hobbies and The I&E Network next Wednesday night. This is a great opportunity for all of my clients to get answers to questions you might have. If you are stuck on your blog or web site – please try to attend. I think it will help you a bunch. I will start with the questions sent in advance of the webinar – please send them to contact@takingaimmarketing.com. I will then try to leave some time for LIVE questions, but to guarantee your question is answered, try to e-mail it (or them) in advance. Remember, if you have a questions, chance are that others have the same question. Please REGISTER and plan on attending if you can. Once you are at the registration page, there is a link to show the webinar time in your time zone. I have been getting a lot of questions lately about the online webinar I presented for The I&E Network. Q: Why should I use the “Insert More” tag in a blog post? A: Often times, blogs are set up to show the latest post on the home page. When someone visits you home page, they are able to read your latest post. While this keeps your blog fresh and always changing, it also can stop your blog visitors from visiting the “interior” pages of your blog. If they get to read the entire post, right on the home page, why would they click to the “post” page? If they don’t visit the Post Page – they cannot comment on the blog post. Therefore, using the “Insert More” tag is usually a good idea. This tutorial video is for those using the nextgen gallery plugin. It shows you how to upload pictures to a specific gallery, insert a title and description for each picture in the gallery, and how to move or copy images from one gallery to another. A client of mine in Australia, I won’t mention any names – (cough…cough…david..cough…cough…valleys guitars) – prompted me to make this video after he called my original tutorial video – $#%^t. He asked me to go slower and explain (thoroughly) what each step was and to make it big enough to see what is going on. So, in order to make the video larger for easy viewing, I did not use youtube, instead I uploaded the video to my web server in wmv format. I also tried to go very slow and explain what each step was in this process. My client (still to remain nameless) gave his approval, and told me I could remove the $#%^t tag. Download the tutorial video here. Thanks to David (oops) for the honesty.